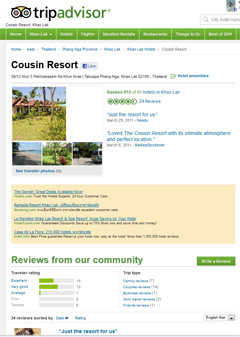 The Cousin Resort is located in Bang Niang Beach, the second largest township of Khao Lak. We are only a few minutes walk from our resort to the beach, yet a 10 minute taxi ride will take you to Bang La On, the main township and centre of Khao Lak for more shopping, night life and restaurants. From the Cousin Resort it is also only a short stroll to local restaurants and bars both on or facing the beach and on the roads upto and on the highway where there are even more. Besides that: Cousin Resort is only 150m from the nice Bang Niang Beach ! You can find our location here on Google Maps. Just zoom in on our landmarker. Khao Lak is about 70 km or just over an hour from Phuket International Airport, which is the main entry point. Flights arrive from Bangkok or Kuala Lumpur as well as direct flights from Australia and European airports. Visitors arriving from Phuket Airport are transferred to their accommodation either by their resort's own transfer service or by taxi. Public taxis at a set rate can be organised on arrival at the airport. The Cousin Resort offers transfer services for all party sizes at competitive rates. The bus is easily the most economical way to travel and an adventure in itself. You can buy tickets and board at the major Bangkok public bus stations, or if you are stopping at Khao San Road, you can catch an overnight bus departing in the evening, to all southern destinations including Khao Lak. You will stop very early in the morning at Khao Lak. A bus trip from Bangkok to Khao Lak takes about 10 hours. You can economize by making the trip from Bangkok (or elsewhere) to Khao Lak by taking the train, and if you have the time, it can be good fun. Most people opt for a second-class berth in a fan-cooled or air-conditioned compartment, while a private first-class cabin for two can be very romantic! Either way, the cabin service is usually quite good. Check out the Rail-Bus tickets. They can be purchased at the train station in Bangkok. From Bangkok, you take the train to Suratthani and from there the bus to Khao Lak. Increasingly, visitors book a hire car on arrival at Phuket Airport or when transferring from a Phuket resort, which gives them greater flexibility and accessibility to Khao Lak’s many attractions, particularly those not featuring in popular tours. Many visitors also come from Krabi or the surrounding area and islands to the south by road a journey of 2 - 3 hours, or from Ranong to the north about 3 – 4 hours, or Suratthani from the north east, the best way to come from Koh Samui or Koh Phang Ngan by road, taking about 3 - 4 hours.